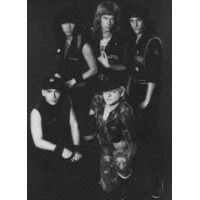 Accept is a German heavy metal band from the town of Solingen, originally assembled in the early 1970s by vocalist Udo Dirkschneider. They played an important role in the development of speed metal, being part of the German heavy metal scene to emerge in the early to mid 1980s. The band's 1983 album, Balls to the Wall, subsequently became their most successful release, featuring its well-known hit with the same title. Following their disbandment in 1997 and brief resurrection in 2005, they reunited in 2009 with former T.T. Quick frontman Mark Tornillo replacing Dirkschneider, and consequently releasing their highest charting album to date, Blood of the Nations. They have sold over 27 million albums worldwide.